Saying sorry has never been so crafty. Apomogy is an ongoing community art project about saying sorry with a pom pom. 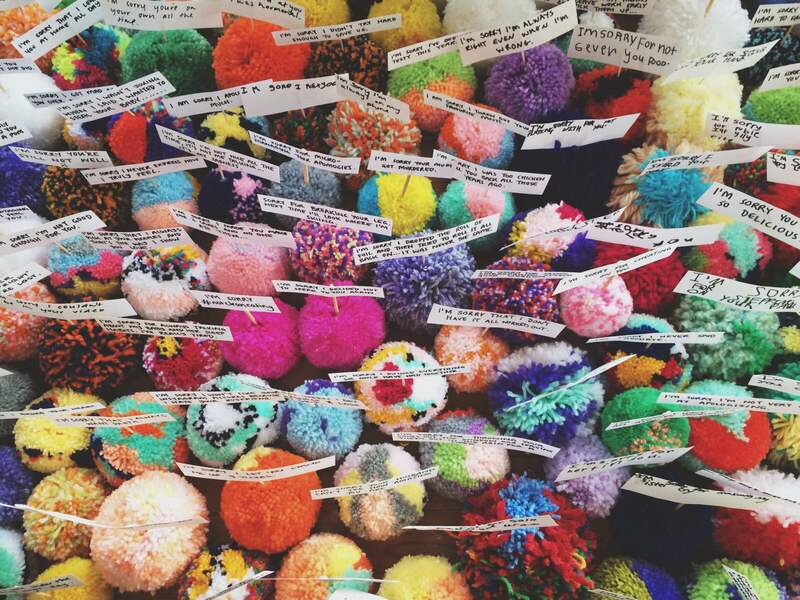 The Apomogy project began in 2015 when creator Rachel Burke attached an apology to a pom pom as a genuine gesture to say sorry to the people in her life. After photographing and sharing her apomogies online through social media others began sharing their own apomogies with her. Since then, Burke has received and made over 1000 apomogies from around the globe. Apomogy is an exhibition of apomogies from around the world. Some apomogies tell comical stories of harmless acts, others tell heartfelt stories of remorse and regret. Some apomogies are hilariously relatable; others are gut-wrenchingly shocking. Regardless of the reason to apomogise, Apomogy encourages you to get an apology off your chest whilst getting crafty.